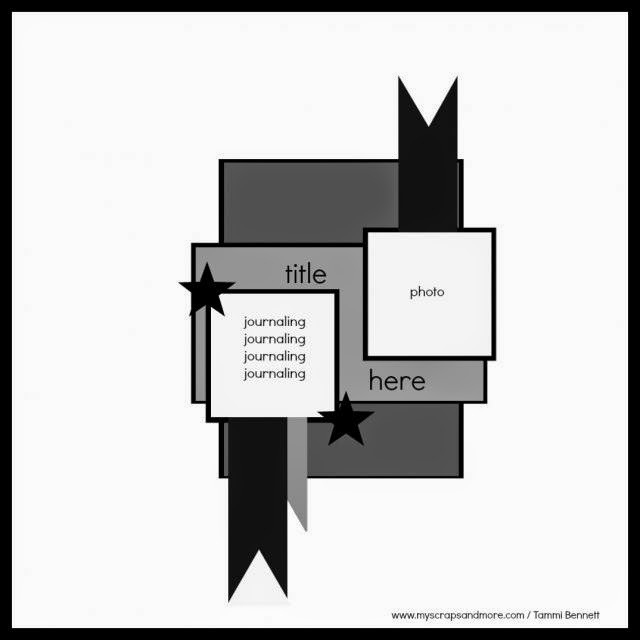 Today I have a post-crop day layout for you. Since then I have had a serious craving to craft more! And after this week I should hopefully have a little more to for it too! Surprise. Surprise. I was inspired by a sketch challenge, this time completely. I found the sketch over at My Scraps & More number 86 and just loved it soo much plus the prize is fabulous, so I actually went looking for a photo to match. Normally its the other way around or an instantaneous "yep, that photo this sketch". The square picture spot sent me to my instagram feed to source one. There I found this shot of my children on a particularly destructive day and was shocked that I hadn't scrapped it or at least printed it early! It is a perfect representative of my days. The Simple Stories "Daily Grind" was a no-brainer for this layout!! The 6x12 page elements sheet was great to help convey the day/story and emphasises just how many times they'd done this that day. For me this is a lot of journalling. I wrote outside on the exact moment as that was already covered. I struggled (and still am struggling) with the title. I knew the words but couldn't find the right font/lettering. I wish I had of used smaller thickers for the 'in' and just wish I had enough letters to use the 'partners' stickers for the word crime too! Unfortunately there is a light sprinkling of white on the photo as I had an oversight while misting a different page, woops. The 'Hey there' was a perfect embellishment as I probably said that once or twice when I caught them emptying again. Note: I am pleased to report that this page was chosen as one of the Top 3 at My Scraps N More. Great page, but I think you linked it up at Stuck?! in error. Yes I did. Woops. I have removed the link. I am currently working on my Stuck?! entry now and got a little mixed up. Sorry. This is such a fantastic take on the sketch Nicole! What a fun page! Thanks for playing along at My Scraps & More!! Sounds like you've really got your hands full! Wonderful layout depicting your day! Thanks for playing along with us at My Scraps & More. such a fun page and looks like my house some days!!! thanks sooo much for playing along with MSAM!!!! Such a fun page! Love all the colors and fun take on the sketch. Thank you for playing along with us at My Scraps and More! Awesome LO! Thanks for playing along at My Scraps & More!! Awesome take on the sketch! Thanks for playing along with us at My Scraps & More! Oooh, I love this!! Beautiful layout! So glad you joined us at My Scraps! Fun page! Thanks for joining us at My Scraps and More! OH this is cute, love all your embellies!! Thanks for playing along with us at My Scraps and More!! Crazy Hair Days - Stuck? !